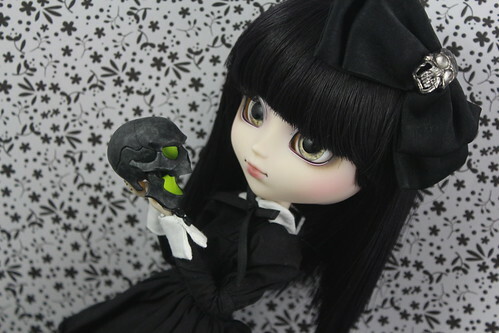 ← Sailor Moon x Pullip- Pullip Black Lady Announced! Last year, Hobby Japan launched a new magazine called Dolly Japan. 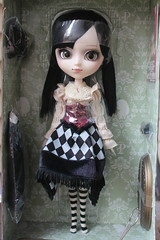 The second issue of Dolly Japan featured a Pullip on the cover, who would later be released as Pullip Laura. 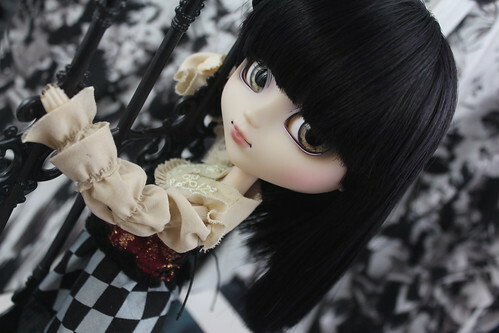 In addition to having a Pullip grace the cover of the second issue, there were several articles about Pullips in Europe. One of these articles featured British collector and photographer Laura/Pure Embers one of the dolls she had showcased was Laura (the doll on the cover) and one of the others would go on to be released as Pullip Alura. 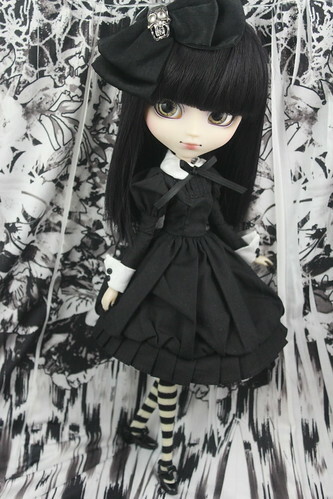 Pullip Alura was announced for release via the fourth issue of Dolly Japan magazine back in May although she was not to be released until October. 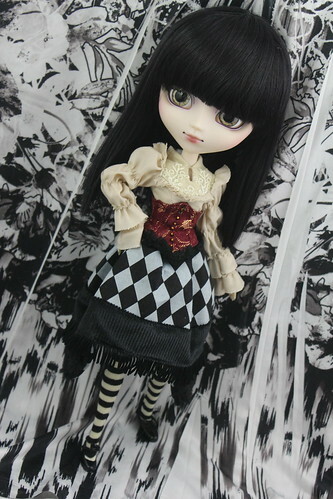 Pullip Alura is a part of Groove’s Creator Label line, she is the result of a triple collaboration she was styled by Laura/Pure Embers, her face up is by Mitsubachi@babybee and her clothing was designed by Momolita. 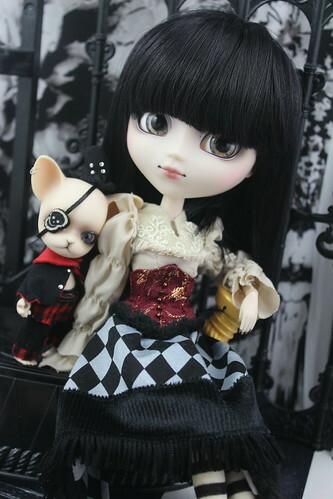 Pullip Laura was designed by the same trio. 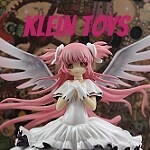 In Japan, Alura was a Hobby Japan exclusive with a MSRP of 18000 yen. 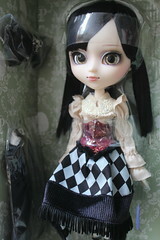 JPGroove was fortunately able to offer a small number of Pullip Alura via their website for international fans of Pullip. 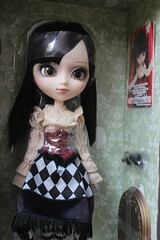 Alura was priced at $150 via JPGroove, I preordered her via their website and she arrived this past weekend. As of this writing, they still have a few spare Alura available via their website here although I do not expect them to last very long. 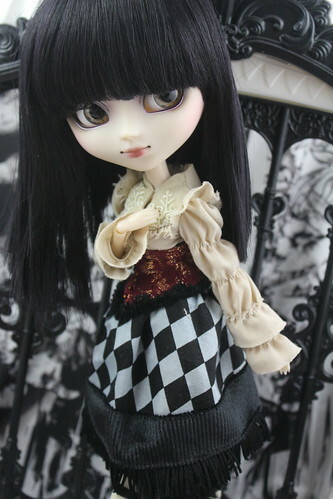 I was personally very excited about Pullip Alura, she was the first 2015 Groove doll that I had purchased this year. My attention had been pulled in other directions this year as I focused on diversifying my doll crew a bit and going after some older releases I have been wanting for a while. Alura was so special that I couldn’t risk missing her, she is a gorgeous doll for sure but I can’t help but feel slightly disappointed with her quality. Perhaps I was just unlucky, even with her flaws I don’t regret buying her as she is just so gorgeous! Training the animals is my favorite part of our Gothic Circus….Watching them amaze the crowd with our tricks makes my heart sing…. Feel Like So. 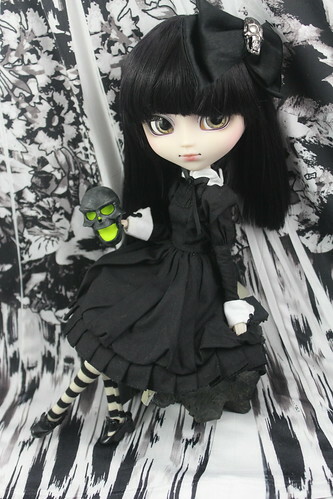 Alura comes with quite a bit of clothing, including a blouse, skirt, corset, tights, petticoat, black dress (this dress is identical to Pullip Stica’s), shoes and an oversized bow with skull. Alura comes with two different looks, I really like that there choice and you can dress her how you prefer I personally prefer the classic black dress but both looks are really strong. I like that her stock is versatile with lots of pieces to mix and match. She of course comes with the standard card and stand (gold). 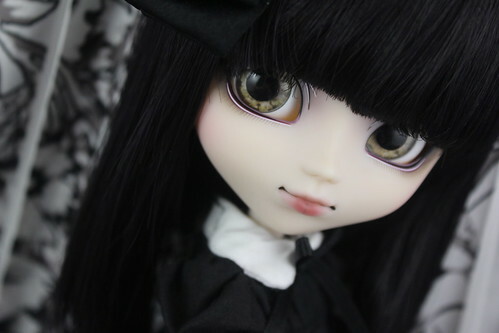 I had initially thought that her face up would be identical to Pullips Seila & Laura but it’s actually been changed a bit. 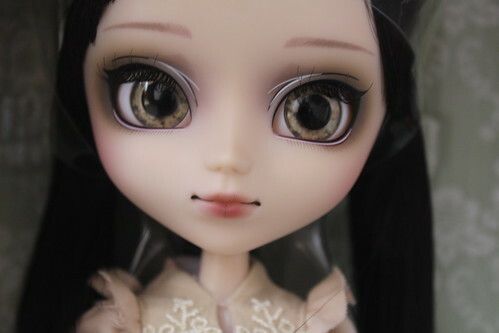 She has completely unique eyebrows and the lips look a bit lighter as well, I eventually need to do a face up comparison between Pullip Seila and Pullip Alura (I lack Pullip Alura). I love her smokey eye make up countered with the pops of white eyeliner and those delicate eyelashes. 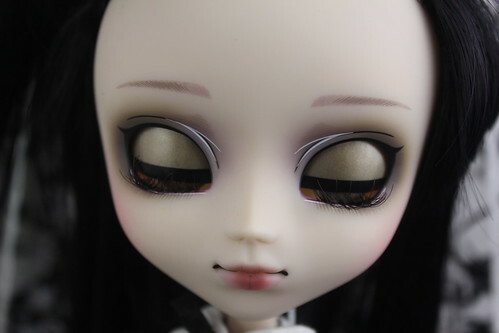 I love the gradient paint style of her lips. The only thing I’m not absolutely in love with is the premium eye chips, I would have preferred a different style of chips for her. Speaking of her eyes, Alura’s eye mechanism was stuck and would not move right to left the problem eventually fixed itself but it was a bit frustrating. She has pretty gold eyelids. One of the issues I had with Alura was her wig, it admittedly doesn’t look bad from the front though one side seemed to be a bit longer than the other but the cut in the back is incredibly uneven ^^; . 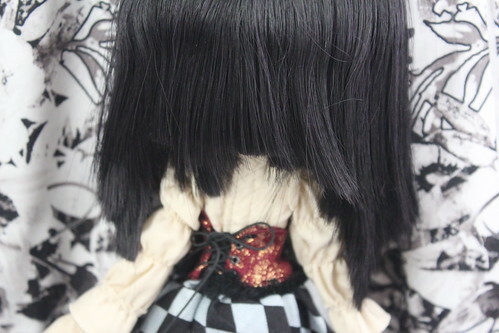 It’s a shame the cut was a bit dodgy as the quality of the wig is nice it’s very soft and the color is nice, it’s black with a subtle mix of dark purple. Overall the quality of Alura’s stock is really high but the maid’s dress on mine was slightly flawed the collar on one side was sewn on slightly askew which made it want to stand straight up one side, I was able to fix it though. I was really impressed with quality of the blouse, corset and skirt they were well-made and I adore her little buckled shoes with bows. One of the things that had kind of bothered me in the promo photos of Alura were the colors of the blouse/skirt/tights which are still slightly maddening to me, I wish they matched slightly better. The shirt is beige while the skirt is more or a pure white/black and the tights are almost off-white/black. The colors actually work together much better than I had anticipated in real life. There is a really impressive amount of detail in Alura’s shirt and corset. The shirt is embroidered around the collar. I like that the shirt is such an unusual silhouette with all the layers of ruffles of her sleeves. The corset is immaculate, I can’t get over how well made it is and I love the bit of a ruffle on the bottom. The corset laces up the back but one of the sides is velcroed so if you want to remove the corset you do not have to lace/unlace it. According to her “feel like so” poem Alura is an animal trainer in the Gothic Circus, somehow Pang-ju Pome-Pang seemed like the perfect animal companion for Alura due to the clown/animal theme. One of Pome-Pang’s eyes has been replaced after a tragic juggling accident, somehow this only seemed to make him even more of a perfect companion for Alura. Alura taking a break after showtime with another one of her trained animal friends, Pang-ju Rambu-Pang. Alura is one hell of a showstopper! Alura has quite the intense gaze! 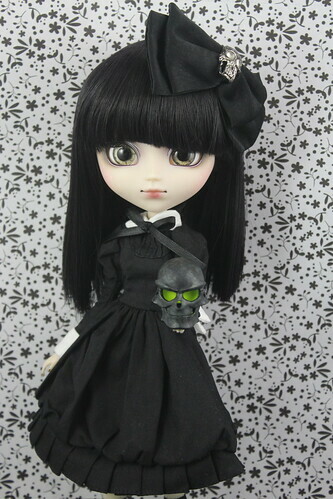 At first I had wondered why Groove had seemingly chose at random to include Pullip Stica’s dress with Alura but the second I saw her in it, I knew it’s because it is absolutely perfect for her! There is almost something unsettling with how good she looks in this dress, she has such an ethereal quality about her and somehow the dress just exemplifies it. Lately, I’ve been somewhat obsessed with American Horror Story so when it came time to name Alura I decided to name her after one of my favorite characters in the first season Moira. I won’t spoil the show for anyone who hasn’t seen it yet but Moira is a maid. I know it seems like naming her after a character from the fourth season Freak Show would be more fitting but frankly not many of the characters were very likable that season and somehow Moira just seemed to fit. Alura admittedly came with a few flaws which was slightly disappointing but her issues were all things I can fix fortunately I have the confidence to do these things after handling hundreds of dolls. I love her despite her imperfections as she is just that well made of a release, she really stands out as something special this year especially when you consider just how many similar looking anime collaborations we’ve had this year. I love my spooky little girl and how perfect is it that she arrived home to me on Halloween? Alura stood out as being so special to me that I decided that her page should be the first in something new I’m trying, basically I intend to eventually make a page for each and every Pullip release that gathers all the pertinent information/promo pictures about that release in one place. I will be adding more pages as time allows but this is definitely going to be more of a long term project as I’m essentially a one man show. 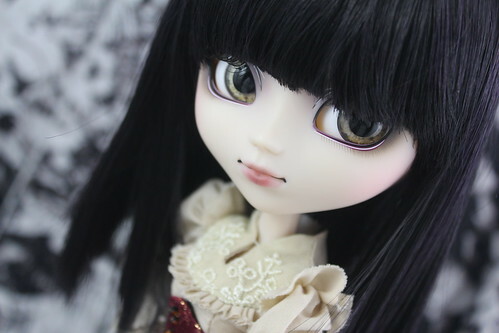 Believe it or not, there are more photos not featured here of Pullip Alura on my flickr :O . 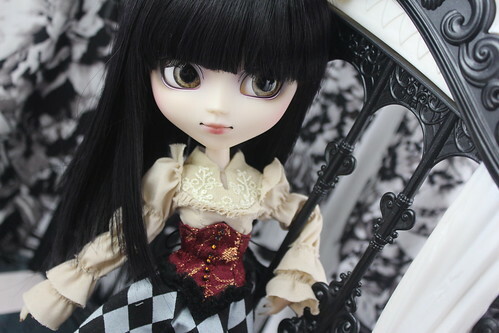 As of this writing, there are still a few Pullip Alura available via JPGroove. Sorry things turned out so long this time but what can I say, I’m in love! 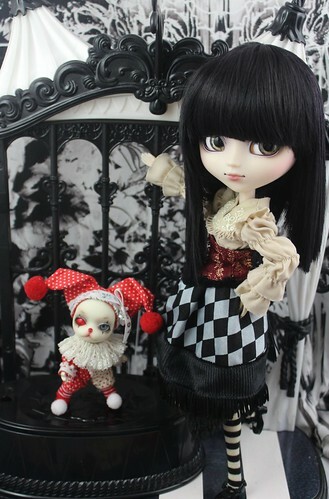 This entry was posted in Pullip and tagged 2015 pullip, alura, creator's label, Dolly Japan, fashion doll, jpgroove, pang-ju, pome-pang, Pullip. Bookmark the permalink.